Hidden behind a secret door between a police station and Doris Bistro in the rooms of a former shop on Brunnenstrasse, opposite Weinsbergpark in Mitte, is one of Berlin's most exclusive cocktail bars. Named after the historic Champagne cocktail which offers a nod to former U.S. president James Buchanan and his vice-president, John Breckinridge; from the street, the bar is not immediately obvious and is accessible only by pressing an inconspicuous buzzer on the wall outside. The focus of Gonçalo de Sousa Monteiro and Holger Groll's intimate speakeasy is the bar table, the only furniture in the room, designed by ultra cool Zurich design house, Bask. The perception of the massive sleek black wooden table in the centre of the dark room is enhanced by the cool lights above the one bartender and his 14 guests. This results in a small space which at the same time offers a variety of different atmospheres bringing the guests closer to the mix station where the small menu of historically inspired cocktails are produced. "Of all the bars we review in Europe, secret doorway speakeasies are never the easiest. There's a whole pretence about simply getting past the usually unfriendly doorstaff and then trying to avoid the 'who the hell are you?' stares from the bartenders and your fellow drinkers. For the large part, this was definitely the case with Buck And Breck in Berlin however we were soon made to feel more welcome by the fact that, quite bizarrely, three of the other seven guests in the intimate dark room were good friends - one a top bartender at The Zetter Townhouse in London and his brother from The Liar's Club in Manchester, whilst separately, another bartender from Kaufleuten in Zurich lived in the tiny village on the Rhine that I also live in. The spookiness of these two chance meetings in such a secretive hideaway would probably be a case for the X Files. Forget Mulder & Scully though, we were here to review Buck & Breck, and to a large part it lived up to its reputation as not just one of the best bars in Berlin, but one of the best in Germany. 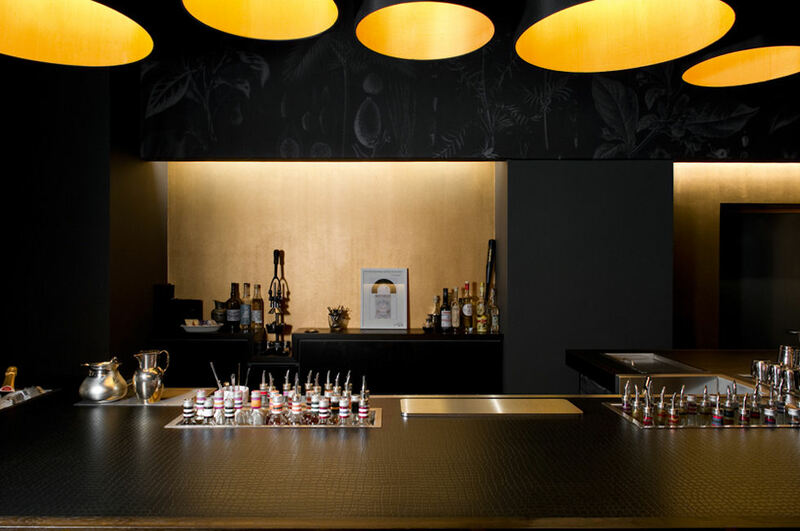 Designed by Swiss architects Bask, with influences from the bartender owner Gonçalo de Sousa Monteiro, who originally came to Berlin from Portugal to study architecture, the room with its high quality fittings is absolutely beautiful. The 14 guests who've successfully made it through the door, sit around the large black table watching the bartender mix the cocktails or, during our visit, spectacularly fail to lance a bottle of Champagne in front of you. Sadly, for such a small bar, it lacked personality with the bartender doing his job and not really interacting with the guests around him, almost like a croupier in a casino. A second person acts as a waiter and doorkeeper. I'd like to think that the two were the celebrated owners Gonçalo and Holger, however as the conversation was kept to a minimum, it's hard to say so we just nicknamed them Buck and Breck. The cocktails are good, served in beautiful copper brass cups, although the menu is short and virtually only dry gin, whisky and brandy based, priced from €10.50 but not specified (our's were all €14.50 each). There's also a good house Champagne and off menu cocktails are welcomely made with care to match your requirements. Provided we can get through the door for a second time, we'll definitely revisit Buck & Breck. 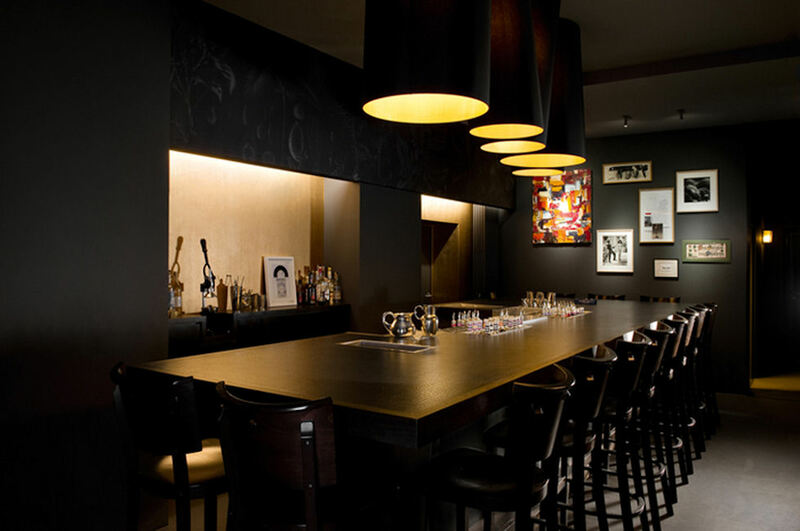 It's certainly one of the highlights of Berlin's amazing bar scene."